After business intelligence reports showed that 99.9% of Shutterstock's users have never used Shutterstock's value brand Bigstock, we decided to craft a downsell strategy directed at folks who had signed up for Shutterstock but never purchased anything. We emailed a group of 6 million people, divided into segments by how recently they opened a Shutterstock email. We wanted to simply find out what offer they were interested in, so we ran an A/B/C offer test. The A group was sent a series of three emails with the 7-day Free Trial offer, each email getting progressively urgent and action-based. 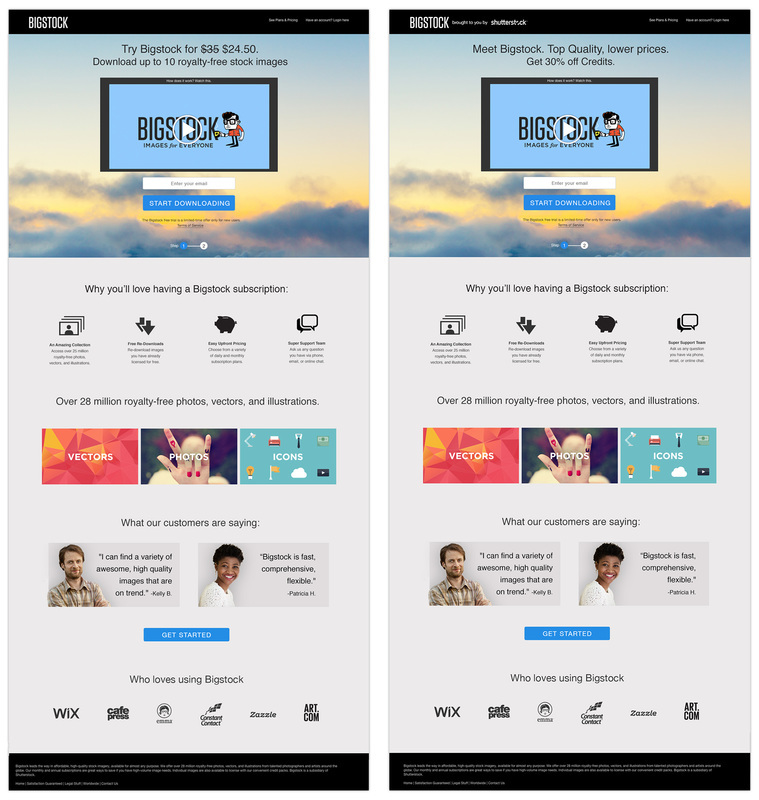 For a secondary messaging test, The A group was divided into two sub-groups, each one clicking to a different landing page. The first group was a control, while the second group received messaged referencing Shutterstock. The winning offer from Round 1 was the 7-day Free Trial offer. Since the last round we had discovered from a short user survey that these downsell customers were interested in low volume, if anything at all, so we tested in a new offer, which was our 1 free image a month trial, which is simply a way for Bigstock to get users in the door and on an email list. The landing page winner from Round 1, across all offers, featured the messaging that referenced Shutterstock. The B group was also sent to the winning landing page with messaging that references Shutterstock.